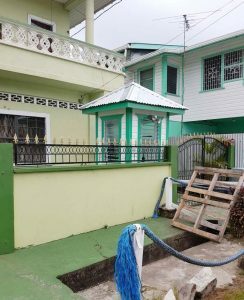 $540,700 was spent to construct this guard hut at the Permanent Secretary of the Ministry of Education’s residence at Bent Street, Georgetown. Several eyebrows were raised over the size of the structure, and the amount of money that was spent to carry out the project. The structure is approximately five feet in width, five feet in length and about eight feet high. And judging from it appearance, the structure had recently been painted with the electrical components already in place. The contract was awarded to Linden Ogle, who was listed among the contractors that submitted proposals for the construction of the hut. Concerns were even raised over the selection process since it is alleged that it was the same contractor that was hired to construct a previous hut for the PS during his tenure at the Ministry of Indigenous People’s Affairs. According to documents seen by Kaieteur News, the expenditure was listed under line item 6242 as “Maintenance of buildings” when in fact, the money was used to construct a new structure. A Ministry official has labelled this as a ‘misappropriation of fund’. Welch was appointed the PS at the Ministry of Education during the reshuffle of Permanent Secretaries by Government earlier this year. A photograph of the hut was sent to another contractor and an estimate was done which revealed that the structure should have cost the Ministry approximately $90,000 to build. The contractor intimated to this publication that he could have constructed six huts with the awarded sum. Welch via telephone yesterday, told Kaieteur News that the hut needed to be constructed because persons were frequently going into his yard at nights apparently to steal his belongings. 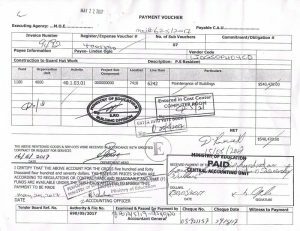 The payment voucher states that the money was paid under ‘Maintenance of buildings’ when it was a brand new hut that was constructed. “Guys were coming into my yard frequently, going up the stairs and hitting on my door and window – my next door neighbour can attest to that. I thought it prudent to have a guard hut built,” he lamented. Welch said that he had no part to play in the construction of the hut. He said that all protocols were followed, including the three-quote system. Welch was reminded that his blessings were given on various stages of the project since his signature of approval was affixed to most of the documents seen by this publication including, the disbursement of funds. He was asked to provide a rationale for signing off on a project which sole purpose is to benefit him. Asked if he thought that there was value for money, Welch said, “Is greenheart they use. But I don’t know about prices and materials. The senior works officer; he will know about that. I really don’t get involved in them kinds of things. I’m just the Head of Budget and the finance people they will deal with that with engineers and the works people.